Combining the simple elements of missions style with first rate craftsmanship and top quality materials, the Amish Furniture Ohio Mission Dining Chair is one that truly shines. The thinnest spindles are fashioned to create a chair back that draws interest while it keeps you comfortable. A squared back and generous seat make this mission chair a candidate for the finest kitchen or dining room collection. Settle into the comfort of Amish made dining chairs that will last far beyond chairs made of lesser materials. For dining room furniture that creates the feel of family while providing maximum comfort and function, DutchCrafters has exactly what you need. Custom options allow you to enjoy this mission style furniture handcrafted to your specifications to best fit your home decor. 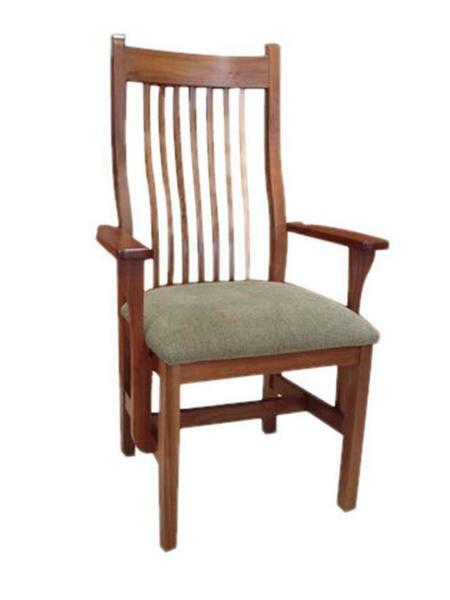 These dining chairs are made in Ohio and are made from fine solid hardwoods with all the important design elements like mortise and tenon construction offering maximum strength and durability.